There are a small handful of chess games that deserve the title 'epic'. Of those, some are remembered as much for their off the board significance as for the game itself. One can think of Botvinnik - Capablanca 1938, heralding a new Soviet dominated era, and of Spassky - Fischer 1970, a defiant last stand at the Olympiad from the World Champion against the relentless progress of the American. 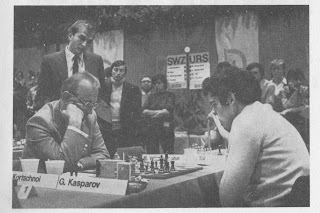 Viktor Korchnoi vs. Garry Kasparov at the Luzern Olympiad 1983 is arguably the greatest of them all. The Soviet defector, who the Russians refused to play against in regular tournaments, vs. the rising young star of world chess. The game, a super sharp Modern Benoni, didn't disappoint. Kasparov sacrificed a pawn, but Korchnoi fought fire with fire. Both sides exchanged great moves interspersed with mistakes, until Korchnoi, under severe time pressure, finally went down. You can play through this wonderful game online. The photo, during the tense middlegame, captures Korchnoi in thought over his move and a concerned looking Kasparov. Our question is can you name the two famous players watching over Korchnoi's left shoulder? The on in the turtleneck is Victor Karpov.